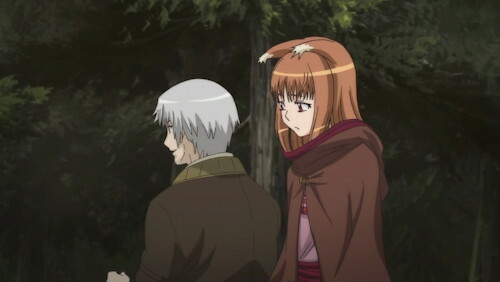 The increase in emotional drama around halfway through the first (of two) story arcs in Spice and Wolf season 2 had me riveted, but also afraid that it was going to step onto the wrong side of the drama line and start going downhill. Boy, did it ever not do that. Turns out that the things popping loose dramatically speaking made far more sense to the characters than it seemed at first, and indeed the strong characterization itself is what made it seem that way—they essentially dupe you into making the same rather obvious mistake that Lawrence does. The second story arc has fun for a little while, then takes a melancholy turn that—this time more obviously—fits completely with the characters, and is every bit as entertaining. Lawrence sometimes gets the upper hand, and it's usually Holo's ears that tell you when--so expressive you almost wish she didn't wear a hat so often. That’s an interesting thing about this series; when characters are broad, however entertaining and appealing they may be, the viewer can excuse a fair amount of out-there behavior without it really seeming out of character. This makes it much easier to write things around them, since you can nudge them one direction or another easily enough without breaking anything for the viewer. The more real the characters seem, though, the more precise and careful the writing has to be, because even things that are slightly out of character will stick out exponentially more. In a way it’s limiting (I’ve run into this writing stuff of my own), because realistic characters sort of write themselves—and if you don’t let them do what makes sense to them, the audience is almost certain to pick up on it. Getting back to Spice and Wolf, the concept sounds broad but the characters are so well-realized that it is very much in the latter category, to the point where even a slightly off note is going to stand out. This is a good thing overall—it means that the characters work, and come across as real. But it also means that it gets harder and harder to write around them without screwing up. As of the end of the second season, though, the series succeeds at not doing that—I still bought the characters entirely, and am every bit as in love with them as I was at the start. More, really. Its only real mistake it makes is going a little easy on some background justification that, had it been hammered in a little more, would have made you think less about whether some of the things the characters do make sense or not. They do make sense, it’s just that the reasons aren’t implied strongly enough beforehand. This was also an issue in the first season—Lawrence’s blow-up after being turned away from every merchant house in town; it was implied that the reason was him having a woman with him, which was considered inappropriate for a merchant in his situation, but if they’d made the point a little more strongly you wouldn’t have had to step back and process that Holo was the reason, not his getting stuck in a very bad deal. There’s considerably less physical drama in the second season, but interestingly, due to the heightened emotional content, it actually feels more dramatic, at least to me. It also makes complete sense—if every story ended in a wild last-minute escape thanks to Holo’s supernatural abilities, it’d start to seem contrived after a while (indeed, she never once turns into a wolf in this season, and its no worse for it). What it does do is start to acknowledge what happens when a human and a wolf deity start to do more than just goof around and enjoy each others’ company; she will outlive him by centuries, which, when you think about it, does give a realistically bittersweet little twist to her perception of the whole relationship. And, again, this deepening of the relationship is another situation where the well-developed characters could be dangerous—it’s easy to blow the chemistry if the characters are strong enough you can’t just have them stare lovingly at each other by way of motivation. And, again, it definitely doesn’t—everything rings true, and indeed the subtle romance is hugely effective. Really, in a way, it’s about as romantic as anything, with romance being defined as a real relationship, not just heat. The increasingly chilly weather mirrors the emotional tone, to a degree--cozy, but melancholy. There were only two things I can’t say I unreservedly liked. One is that I wanted to see Lawrence show a little more interest in some books Holo got to look for legends about herself. Admittedly, that’s not really his thing, and it’s entirely possible he didn’t want to know too much about her past—might weird him out, or scare him (indeed, he pointedly doesn’t ask much about her past), but while it may not have been out of character I’d have liked at least a bit of time spent with him looking over her shoulder or a more specific acknowledgement of why he wasn’t. Heck, I want to hear some of the legends myself, too. Not all the merchants Lawrence meets are cheerful and outgoing. 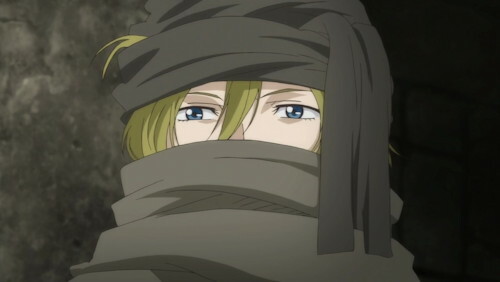 Which is good, once you shake the feeling that Zelda is traveling incognito in the wrong series. The other is the end; it ends on an unusual note; positive, but a little sudden and very open as to how this particular mercantile caper will close (Holo pretty strongly states she’s not about to just walk away). It’s entirely possible the series is leaving something open for a third season (which would be awesome, and indeed this season starts with a bonus episode 0 wrapping up the previous, so that’s quite possibly the intent). It’s just that after the absolutely fantastic up-note the last scene of the first season ended on, I was hoping for something similar. 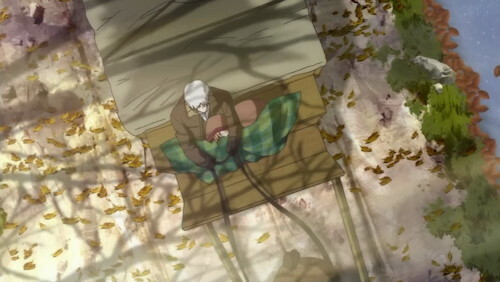 Speaking of episode 0, that right there demonstrates why Spice and Wolf is something special: An entire episode spent with the main character sick in bed, dreaming and talking to the couple of people who come to visit her—and a lot more of the latter than the former. Sounds like a recipe for a dirt-cheap cop-out review, but instead there’s almost no repetition, it tells us a lot about Holo and what she’s thinking (sets up the entire second season, in fact), it’s at least as good as any other episode in the series, and it’s also periodically hilarious. That may not be quite the tour de force of Genshiken spending an entire episode with Madarame’s internal monologue during an awkward silence, but it’s close. It even works in a variant of the humors when Lawrence explains the road to health. That there will be a season 3. Seriously—I can count on my fingers the number of anime TV series that have gone past 26 episodes and remained good to the end, and I can count the ones that aren’t status comedies (Ranma 1/2, say) on one hand. The four seasons of Twelve Kingdoms is the big exception and, given its novel-based heritage, the example I desperately hope Spice and Wolf will follow. But, given the overwhelming evidence of the slim chances of pulling that off, I’m almost as afraid that they will make a 3rd season as I am that they won’t. Here’s hoping that Spice and Wolf is the exception to the rule.